Ghostbusters – Jenny and Jonathan Got Married! Here in the Pittsburgh area, several folks dress up their own automobiles for Halloween. 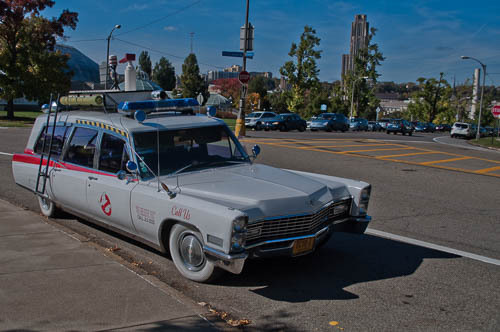 They dress up their autos as Ecto-1, from the move Ghostbusters (1984). Here a photo that I took of one such auto. I took this in front of Phipps Conservatory in Pittsburgh in 2014.